So over at my sweet friend Jen's blog, i art u - she blogged about a pretty sweet Giveaway from Chronicle Books. I love Chronicle Books! The contest is super simple. Simply post a list of Chronicle Books you'd love to own, valued up to $500. If you win, 1 lucky blog reader who posted a comment on the post will also win your entire list of books. So hopefully we have similar taste in books and you like my list - if you do, comment! ;) You can also comment on Jen's list too for another chance to win, if Jen wins! (7) The Art of Pixar Short Films By Amid Amidi *this would be for Nicholas! (8) 642 Things to Draw *this would be for my friend, who is a great illustrator! (22) Weekends for Two in Southern California 50 Romantic Getaways By Bill Gleeson *i think this would be fun to come up with things to do with my husband. Okay this list is totally up my alley! Great choices Danni! I think I may just have to add a few of these to my reading list too! what a perfect list! good luck !! Wow! I hope you (and I) win! Well, I simply have to comment on this one - wonderful choices! I'm going to have to go check out the 642 Things book!!! I'm a big fan of Chronicle Books - their new papercutting book is amazing, a cover by Elsita and an introduction by Rob Ryan? Irresistible! Add the letterpress book, paper + craft, and open studios and I'm in heaven. Whoever gets this list is the luckiest person this season, an instant book collection! this is awesome, danni! you are so on top of all the holiday giveaways this year! Oh, I love these choices!!! You always have such great taste! This is amazing!! I'll be posting my book list tomorrow - yours is a really lovely list too :) Thanks so much for sharing this, Danni!! Such a great list! These would be wonderful additions to your (and my) library! I want each and every item on your list! You just introduced me a bunch of books I cannot wait to check out! I'm particularly into 642 Things to Draw, but you've got a lot of great picks (especially all the "interactive" ones). I love going to the Chronicle Book Store in San Francisco. The store is beautiful and full of their gorgeous books. Love your choices too. I have picked up many of those books to peruse at the shop. Thanks for the opportunity! We've got very similar interests! Great list! The list is terrific - I'd love to own these books. I've already placed two orders from Chronicle Books this holiday season...suffice to say, I'm a bit obsessed. Heehee. I LOVE your list! You have the best taste. That's a great list! I love Chronicle books! Thanks for the picks. I love chronicle books too! I took full advantage of their black friday sale that you blogged about! I have been eyeing the old school letter set and pictorial dictionary for a while now! I love your list of books! I see a few that I'd like to start reading! Great list! Chronicle always has waaaay too many amazing books to choose from. That's a great haul! I love Chronicle Books. Love this list of books!!!! But honestly, how could anyone hate any list of books from Chronicle? They are so amazingly beautiful, all of them! What a fun giveaway! I love the Handmade Weddings book! They all sound so great! What an awesome giveaway idea. I would love to have all of these books too. I'd love to pick up a copy of Creative, Inc. Your entire list looks amazing! awesome choices, Danni! I'd love all of those, too!! I feel so excited when I look at these books. So much possibility and learning! Thats awesome! I have been DYING for the little book of letterpress, Paper + Craft and Handmade Weddings!! I hope you win!!! Oh, how I love books! You have some great selections, here! what?!!! This is fantastic, thanks for posting! All of these are on my list!!!! AMAZING!!! So much learning on one list. These are all great! I've been wanting Handmade Weddings, as I'm getting married in June, and I'd love City Walks: London- I spent a semester abroad there, and would love to go back! that is an awesome idea!! i love your choices. I don't think I have ever seen a more beautiful or perfect collection of books in my life!!! AHHH!!! these books make up the perfect library! the paper cutting book looks gorgeous! love your choices! i certainly wouldnt mind winning them! What a great list! I will definitely be checking some of these out! what great book suggestions! I hope I win! Great job on picking the books! Weekends for two in Southern California would make for some really fun adventures! it's like an instant, homemade library! what wonderful selections, i feel like your house might get more creative just by these books showing up. so fun to scroll through your selections. tis the season for cozy fires and good books. This is awesome!!! The best giveaway I've seen. I love River's Little Book of Leterpress and Listography. You've inspired me to make my own little list. Would love to win! You can comment on my list at http://thegirlnamedtennessee.blogspot.com/2010/12/celebrate-haul-idays-with-haul-of-books.html. Good luck! Great choices of books here! so fun i couldn't resist making one myself! i love the little book of letterpress! So many of these books are already on my wishlist, now to go make my blog post! Love your list too! I even have some of the same books on mine...if you want link back to comment on mine. can't wait to see pics of the wedding, danni! Wow! Great books! Great giveaway! Merry christmas to the winner! ps. i'm also hosting a giveaway on my blog this week. hope you check it out! Awesome list!! I would love to win these!! this is an amazing giveaway! i love your list!! good luck to us both! oh my. my book love radar is so excited!!! I don't need to know which books you are choosing to know I want them. I want all books! I am in love with all things paper... and the rest of your list is pretty great too! chronicle books is the best publisher - I have so many of their books..BUT none of these ;) so one vote for me. Thanks Dani! such a great list! good luck! The pixar stories seems very magical! and so do the crafting books! And the book about the perfect wedding! oh boy, I want to win too. I love books and I love Chronicle! I've been obsessed with filling my bookshelves with literary classics recently, but in the meantime I've neglected books based on my interests. You have a great selection & I would love to spend hours & hours thumbing through each one! I LOVE your choices - I hope you win! gosh your choices are fantastic! LOVE them! fingers, legs, etc are all crossed, hoping! What a great list!! I love your travel selections (especially London by foot), the Handmade Weddings and am curious about the Secrets of Simplicity... Lovely giveaway!!! What an amazing list! Great giveaway! cool giveaway! i'm tickled that you listed the paper cutting book - that's been on my wishpot recently! What a cool idea! 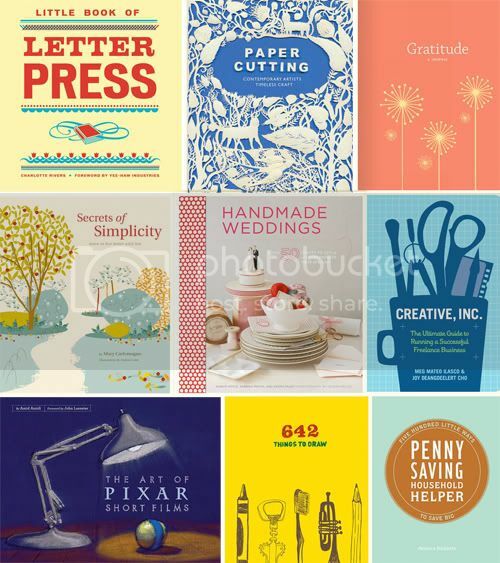 I have been eying the Little Book of Letterpress and Paper + Craft at the bookstore I work at for some time, these are all great choices! this little londoner absolutely loves your selection of books! good luck! But oh dear... I was feeling all done and dusted with my Christmas shopping, and now this gives me all new ideas of what to buy! Great book selection! Those would be greatly appreciated and used in my house! These books all look marvelous! What a great list. Here is hoping you (and me) win the wish list! This is my favorite of all your giveaways. Books, beautiful books. Thanks Danni. Wow, your list is awesome! Count me in! Oh how I would love to read The Art of Pixar Short Films! Perfect books to "read it forward" Thanks! ohh I like your list! weddings, letterpress, letter set and crafts I would love to read about. I especially like the weekends for two in socal (since my husband I live down here too) and city walks: london (we want to go there too sometime!). I love your list, the only book I'd add is "The caligrapher's bible" or anything related to calligraphy (which obviously I adore). That is an amazing giveaway and an amazing list! The Art of Pixar Short Films? OOOH. some of these would make great gifts!! i love your list, danni! here's a link to my list, if you'd like to check it out. Sounds like a beautiful list to me! I would be so grateful to win this set of incredible books with you! what an amazing list!!! thanks for the gift ideas! Wow, what an incredible giveaway! Some of these were already on my Christmas list. Good luck! I want that papercutting book! Yes definitely I'm loving the same lists of books... specially, Creative, Inc.
that is one pretty awesome giveaway! Wow, this would be the best library addition ever. Good taste! i just want your entire list! So glad you picked such great ones, cause it means I don't have to go through and pick them and do all of the math! We seem to have a similar taste.. I love all of the books you listed! I can see them now filling my book shelves ... beautiful! You have great taste dearie. Great list. It would be fun to win all these amazing books. Oh, love your list. Good luck to the both of us! And thank you to Chronicle Books. This list is absolutely amazing, filled with absolute awesomeness. oh, this is great! I love chronicle books too! Fingers crossed that you win!! Great book list! Love your choices! Good luck! Lovin' your list! Here's hoping for a win!